Last weekend I added the nearly ready compost to the garden soil. As I am a beginner with composting the resultant compost was not as granular as it ought to be, but it gave a nice earthy smell. 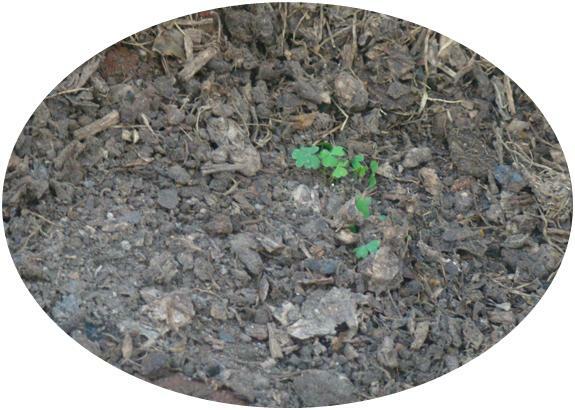 The color and texture of the compost may improve with subsequent cycles of composting as I enhance my skills :). The experience was indeed exhilarating, watching and smelling the kitchen waste turn from the stinky stuff to a nice smelling mixture. This came after 3 months of negligent home composting :), as for the past 2 months I have shifted accommodations, and found it difficult to pay needed attention to the composting pots. But it turned out better than expected. For the next rounds of composting I am contributing the home waste to the pile of garden waste that my landlord compost, so pot composting is on hold. But composting is damn easy, convenient and fun, I wonder why our educated urbanites have turned away from composting. Pause a second when you pick up that dreaded black colored polythene bag and mix all the waste into it, turning away from your responsibility towards your city, neglecting your part in planetary care. Tidiness is not cleanliness. Break away from pessimism and take ownership towards reducing environment degradation. Hey your blog always looks different from others. Nice post. Keep posting and en-light everybody about all these new things.